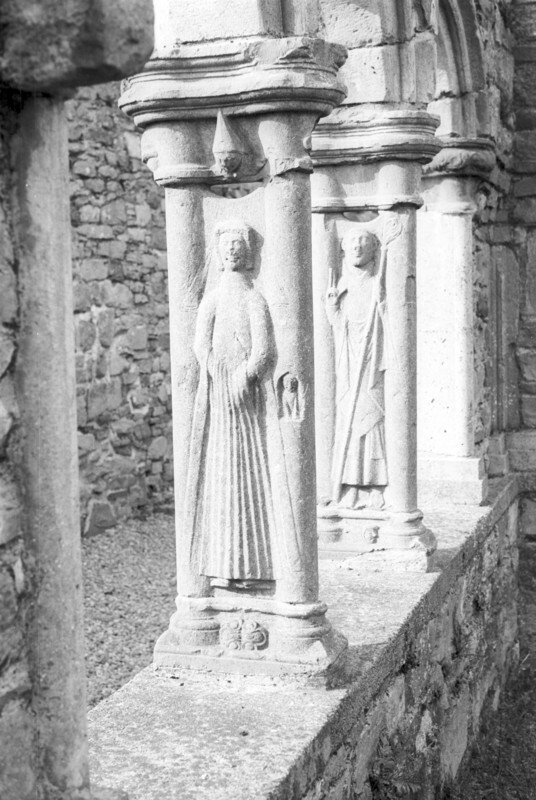 “Cistercian Abbey, Jerpoint, Co Kilkenny, exterior - cloister, pier - figural carving,” Gothic Past, accessed April 22, 2019, http://gothicpast.com/items/show/1175. Photograph by Roger Stalley. View of cloister showing round chamfered arches carried on 'dumb - bell' piers with bell capitals, water - holding bases and figural carvings. The 'dumb - bell' pier, here with round pseudo - colonnettes, later became a standard feature of Irish cloister designs. The foreground pier depicts a female figure in contemporary costume surmounted, between the capitals, by a carved male head wearing a cone - shaped hat. The woman wears a headdress and veil, the latter flowing out over the colonettes and indicated by lightly incised lines. Her long gown falls in regular corrugated pleats from below the waist. Long slits within the folds of the fabric allow her hands to be concealed in pockets. Lappets attached to her elbows allow fabric to flow out over the colonettes. A small seated animal grotesque is carved into the colonette at her left elbow and beneath her feet, between the bases of the colonettes, there is a small foliate carving. The centre pier depicts an ecclesiastical figure, an abbot or bishop arrayed in liturgical vestments, bearing a crosier in his left hand and his right hand raised in blessing. Beneath his feet, between the bases of the piers, is a carved grotesque. The farthest pier has a stiff - leaf carved capital.